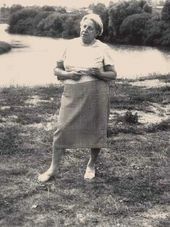 Yekaterina Fedorovna Alexeeva-Belashova was born on 2 December (19 November) 1906 in St. Petersburg. Her father, Fedor Alexeev, was employed in the home of Sergei Botkin (1857-1910), professor of the Military Medical Academy. An avid art collector, Botkin was married to Pavel Tretyakov's daughter, Alexandra. The Alexeev family lived on the ground floor of the Botkin residence. As a little girl, Yekaterina would often play with Pavel Trubetskoi's toy-like sculptures in the attic, this early experience no doubt serving to develop her awareness of plastic form. Later, she was sent to boarding school in Tyrkovy-Toroshkovichi village, Novgorod region. Acting as nanny to younger children, Yekaterina would make cloth dolls and clay figures for her flock. 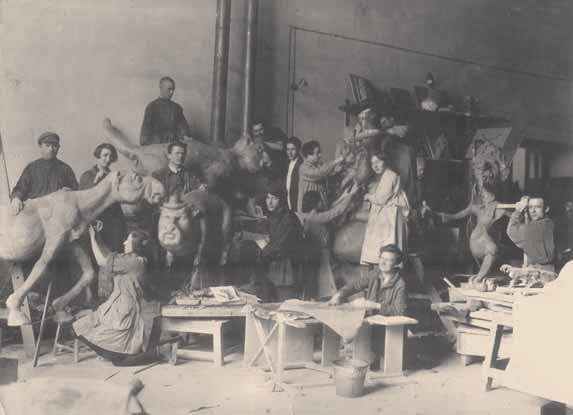 At school, she showed a remarkable aptitude for mathematics, yet upon hearing of the Leningrad Technical Art and Industry College, proceeded to enrol there in 1924, and to focus on sculpture thereafter. Between 1926 and 1932, she attended the Leningrad Higher State Art and Technical Institute (Vkhutein), receiving tuition from Robert Bach, Vsevolod Lishev, Vasily Simonov and Andrei Matveev. 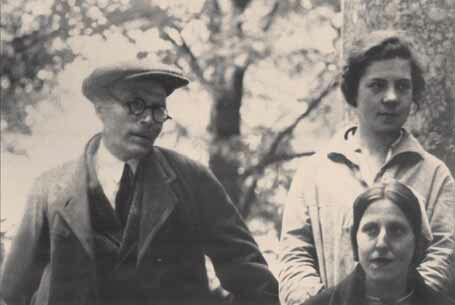 In 1933, as Matveev's postgraduate student at the Leningrad Institute of Proletarian Arts, Yekaterina moved to Moscow. There, she became Matveev's assistant at the Nikolai Andreev Professional Training Studio for Sculptors. Between 1942 and 1952, she taught at the Moscow Institute for Decorative and Applied Art, subsequently becoming a Professor of Moscow High School of Art and Industry, where she remained until 1965. Yekaterina always thought of Andrei Matveev and Anna Golubkina as her main teachers: the former gave her direct tuition, whilst the latter was a major influence on her work. 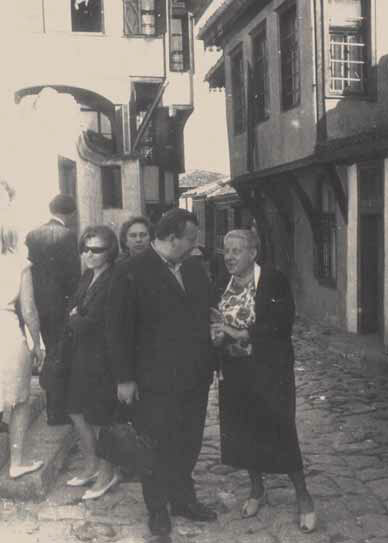 On one of her work trips, Yekaterina met Mikhail Belashov, sculptor and graduate of the Moscow Higher Art and Technical Studios (VKhUTEMAS). The couple married. 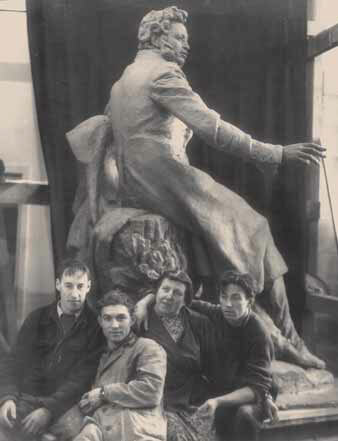 Together, they went on to take part in a number of design competitions, for statues of Vasily Chapaev (1930), Taras Shevchenko (1930-1931), the pilots Viktor Kholzunov (1940) and Anatoly Serov (1941). Belashova's designs were consistently innovative and original. 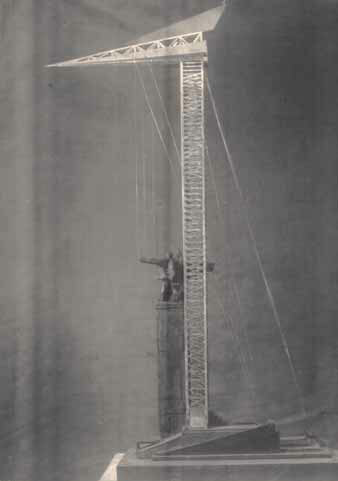 Those for the Shevchenko statue, submitted for the first International competition in Kiev (1930-1931), involved a fascinating construction of taught iron hawsers, which would "sing” in high winds like the strings of a musical instrument: a true reflection of the bold and somewhat romantic mood of those years. 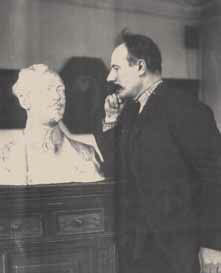 Of Belashova's pre-war statue designs, only one was taken up. The statue of Viktor Kholzunov, pilot and Hero of the Soviet Union, was erected in Stalingrad in 1940 - on the eve of the war. The monument's subsequent history is quite extraordinary. Surviving heavy bombing, it was saved by that which ought to have destroyed it: the first bomb which fell near the statue left a gaping hole in the ground. Shock waves from a second bomb knocked the statue into this hole, and when a third bomb exploded, so much soil was thrown up that the statue was buried beneath it. This saved the monument, although the reliefs adorning its pedestal were lost. After the war, Belashova restored this amazing statue, which rose up out of the earth, like a phoenix from the ashes. 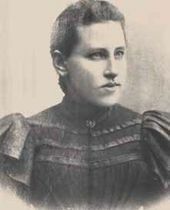 Central to Yekaterina Belashova's work of this period was the human striving for high ideals: the contemporary hero who acts, when action is called for. 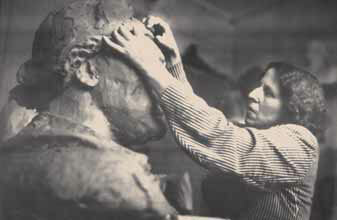 Years later, the sculptor named a series of her works "People who change the world”. She herself, indeed, was indubitably such a person: working every day, she never allowed idle moods to get the better of her. In 1941, war was declared in the USSR. That very year, Yekaterina's husband Mikhail, who had joined the army as a volunteer, was killed near Smolensk. Finding herself alone with her small son, the sculptor turned to art for support - and found it. Her hero is now "The Fighter” (1942; a full-length version from 1957 survives). Sculpture helped Yekaterina Belashova to come to terms with her terrible loss. Her wartime works are clear and simple, totally lacking in pretentiousness. 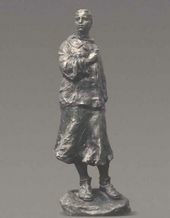 In 1943, she created "Unvanquished” - an image of a fragile, yet steadfast woman, whose very being rebels against the horrors of war and death. Heavy losses have failed to break her spirit: in this, she resembles her creator. 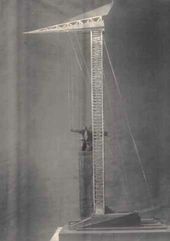 Yekaterina Belashova herself was fighting desperately to survive and carry on living. Her work always reflected the spirit of her time, and "Unvanquished” became a picture of the war years. For Belashova, "the artist's personality and his work are intrinsically linked. Art appeals to the heart, making our minds clearer.” In 1944, she created her "Partisan” and "Portrait of an Old Man”, which came to be known as the "Russian Socrates”. Throughout 1942 and 1943, Yekaterina Belashova developed her idea for a monument to be called "In Memory of the Victims of Fascism”. This was to consist of several figures, portraying images of the war. By 1944, the design was finalised. An oval balustrade with five figures was to be constructed, surrounded by woods. The central space would contain a two-figure monument with simple pedestal, entitled "Love of Man”. Developing her idea in 1945-1946, Belashova created a further two designs, "Grief and "Morning”, to be erected at the two side points of the oval balustrade. The composition "In Memory of the Victims of Fascism” shown at the recent exhibition included the pieces "Grief, "The Fighter”, "The Partisan”, "Unvanquished”, "Morning” and "Love of Man”. An important place in the oeuvre of Yekaterina Belashova is occupied by the poet Alexander Pushkin. 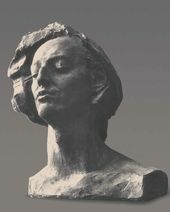 "I will probably never recover from my Pushkinitis,” wrote the sculptor to the eminent Pushkin specialist Semion Geichenko. From the 1950s onwards, she created a number of works connected with the poet. Embarking on a project with the architect Vsevolod Voskresensky, Belashova wrote to him: "Let us work as Golubkina always encouraged us: out of wonder, not out of care and anxiety.” Belashova's love of Pushkin was not only emotional, but practical: the sculptor devoted a large portion of her time and energies to the Pushkin Museum in Moscow. 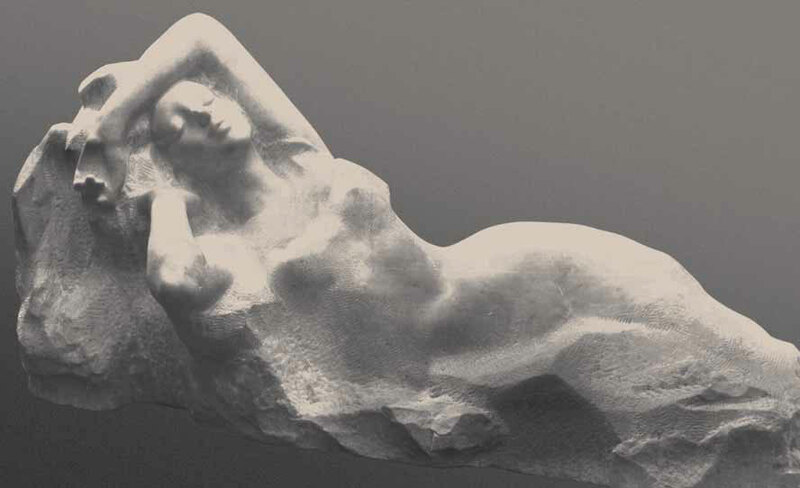 Shortly after the war, Belashova created her "Girl Reclining” (1947). 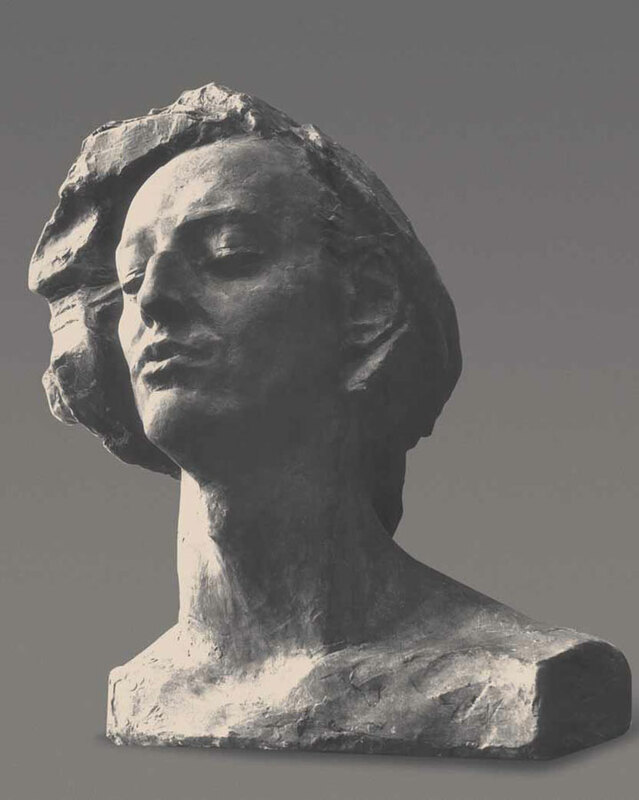 The sculpture has an air of calm and tranquillity: "through the heart, the mind can discover the finest and most profound aspects of nature and human existence.” Yekaterina Belashova often gave her sculptures names: she would refer, not to her "Portrait of Olia” (Zina, Shurka, Anna, Lida), but to "Olia”. 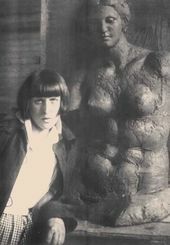 "Olia” (1961) is, indeed, considered by the sculptor's family to be a self-portrait as a young girl. Many of Belashova's pieces appear made to stand outdoors: she dreamed of creating a park, where sculpture and nature would blend harmoniously. Yekaterina Belashova loved company. At home with the most diverse groups of people, gladly taking part in debates on the most diverse topics, she was a good listener and an intelligent speaker. Combining the joy of life with the joy of art, she contrived to excel as an artist, teacher, statesperson and, simply, as a human being. "What a [wonderful] morning!” she would exclaim. 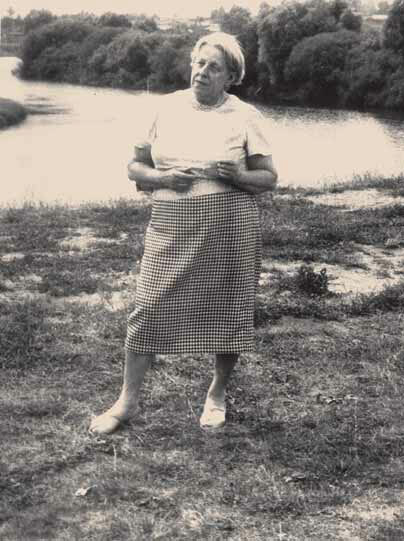 "I shall rest a while, and go to the studio - today, I want to work.” Once in her studio, Belashova allowed nothing and no one to interfere with her work: no visitors, no telephones, strictly no interruptions. 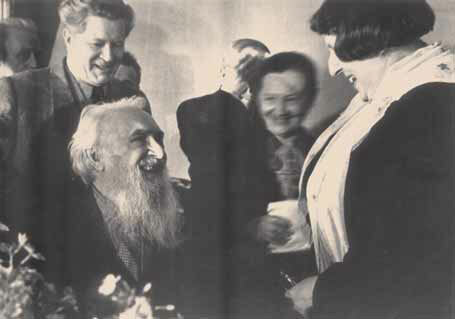 In 1957, Yekaterina Belashova became a member of the Board of the Union of Artists of the USSR. 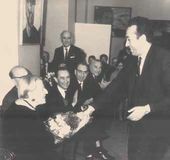 After several years as First Secretary, following the death of Board Chairman Sergei Gerasimov, Belashova took over his duties temporarily, then, at the Third Congress of Artists in 1968, she was elected Chair of the Board. Yekaterina Belashova was a multitalented and multi-faceted personality. She loved making dolls and special costumes for them. After a hard day's work in the studio, she would often get out her sewing machine and set to work, creating new dolls. Realising that she did not have long to live, before going into hospital she packed three suitcases, claiming that they contained her dearest possessions. One of these was filled with letters, including many from Andrei Matveev, Sergei Konenkov and other artists. A second suitcase contained her dolls. Belashova liked to quote a passage from one of Konenkov's letters: "Each and every day should bring joy. Remember this, and rejoice at every day you live.” She remembered these words throughout her life. The organisers of the exhibition and memorial event would like to thank Yekaterina Belashova's son, the sculptor Alexander Belashov, and the art historians Anna Zuykova, Olga Porkhailo and Valentina Ryzhova, who, having acted as chairs and consultants during creative sessions of the Union of Artists of the USSR, were able to share not only their memories, but also their personal archives. Thanks are likewise due to the State Tretyakov Gallery Department of Information Systems and Technologies, Galina Chernusskaya in particular, for invaluable help in making the slide film based on printed and photographic material on the life and work of Yekaterina Belashova, and also to the art historian Nina Volodina who presented the Tretyakov Gallery with an album compiled by Vladimir Volodin, art historian and organisational secretary of the Artists' Union of the USSR and his personal reminiscences of the sculptor. Belashova in the studio, with her statue of Alexander Pushkin, to be erected in Mikhailovskoye. Yekaterina Belashova’s anniversary celebrations at the Academy of Arts, Moscow.